Edgar Wright Teases Luke Cage, Iron Fist and Scott Lang in Ant-Man! Has Edgar Wright been doing homework? Or is he asking us to do our homework? With Ant-Man starting production later this year, we still don't have any confirmed details on the plot. Today, Edgar Wright posted a photo from the animated series The Avengers: Earth's Mightiest Heroes, along with the brief caption "Homework". Is he teasing potential story details and possible characters for this upcoming stand-alone Phase Three adventure? The photo comes from a The Avengers: Earth's Mightiest Heroes Season 2 episode entitled "To Steal an Ant-Man", where Marvel's current Ant-Man Scott Lang steals the equipment used by original hero Hank Pym to commit a series of crimes. It is based on the comic book Marvel Premiere #47, which is also titled: "To Steal an Ant-Man." We've known for some time that the movie would be about a heist. Producer Kevin Feige previously referred to Ant-Man as a "heist film," so it's possible that they are referencing this particular 1979 story arc in the screnplay, which Edgar Wright co-wrote with Joe Cornish. The more important thing to remember is that not only did this story introduce Scott Lang, it also features the first appearance of Heroes for Hire Inc. with Luke Cage (Power Man) and Danny Rand (Iron Fist). As we well know at this point, Marvel has teamed-up with Netflix for four hour-long series based within the Marvel Cinematic Universe, two of which are Iron Fist and Luke Cage. Is it possible that both Marvel characters will be introduced in Ant-Man before they are introduced in their own respective TV spin-offs? This is certainly how Marvel has handled its other characters in creating and setting up it's cinematic universe before, and its likely that's what we will see happen here in some capacity, as these shows will premiere shortly after Ant-Man in 2015. Last month, Marvel Studios confirmed that Paul Rudd is starring as the title character of Ant-Man, although they never specified if he is playing Hank Pym or Scott Lang. If this photo is any indication, we will probably see both characters in this Marvel Phase Three adventure, something that has long been speculated. That just begs the question, where does Hank Pym fit into the story? Will he be introduced in Avengers: Age of Ultron, which opens two months before Ant-Man? That also sounds pretty on target. In this storyline, Hank Pym is an Avenger. The Ant-Man in the movie is not tied to the Avengers yet, so that plays perfectly into the Scott Lang side of the pre-established Ant-Man mythos. Iron Fist and Luke Cage are hired by Hank to hunt down and capture Scott before he can cause any more damage with the Ant-Man gear. Its a great way to usher them into their own TV series, really. Of course, nothing has been confirmed by Marvel Studios, so stay tuned for more updates on this highly-anticipated movie. 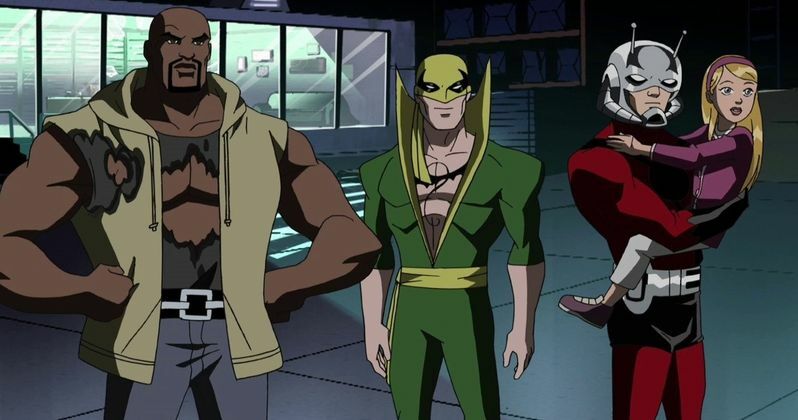 For an idea of how Iron Fist and Luke Cage fit into the Ant-Man mythos, check out this clip from the The Avengers: Earth's Mightiest Heroes which features all three characters.